I’ve always been amazed by artists, especially by how easy they make it look. 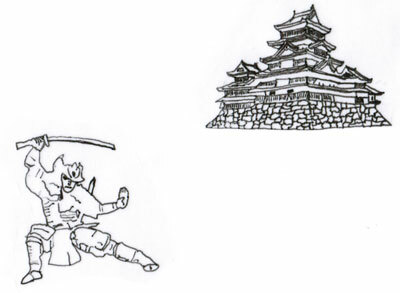 Just love a cool martial arts drawing, like a tiger, dragon, or samurai. I’ve always wanted to do it myself, but never really had the time. Well, if something is important to you, just make the time, as I often tell my students. So I, as the sensei, decided to practice what I preach. Over the holidays, while working on a kids karate book (please don’t ask me how long I have been working on it) I realised how much easier it would be if I could just draw a few pictures and put them in where needed. Only problem, I don’t know how to draw. Minor details! I started researching it (I love google!) and found that you can actually teach yourself to draw by tracing. No, it is not cheating, as some might say. It teaches your hands to move like they are supposed to move in creating your illustration. Does this sound familiar, folks? That is exactly how you learn the martial arts. Your body actually “feels” how a movement should be performed, as the sensei guides you. Not only that, you “see” in your mind the proper pencil strokes that create details, such as shading to create depth in a picture, just as you see the sensei’s fist recoil from a proper strike. I went to Eckersley’s, a great arts store in Sydney, and bought a tracer box. What is that, you say? It’s a box with a light behind a piece of plexiglass, and when you put a photo or drawing on top, the picture, down to the finest detail, is there for you to “copy” (you have to make changes in the final illustration if you are planning to include it in any commercial work, for copyright reasons). Well, needless to say, I have become addicted to this, and it is one reason you haven’t seen a post for almost two weeks. I’ve bought heaps of pencils, pens, paper, and a few drawing books. I’m showing you some of my work here, some of which you will see in the book (yes, it is nearly done!). There is more to it than just “having the right tools”, and the vast majority of my work is really laughable, but I am sure having fun. I realise I have a huge amount to learn about art, and will never be Van Gogh, my favourite, but it feels great to be a white belt—again. Just start drawing. For Kids Karate Sensei Becomes White Belt Again–Part One, please follow this link. Why Do You Study Martial Arts? The samurai trained hard in the martial arts. Their life depended on it. Why train in the martial arts? 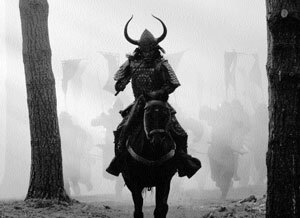 For the Samurai it was a matter of life or death. 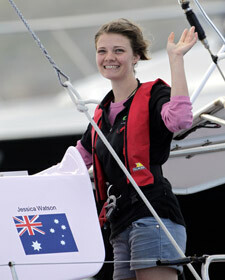 Their very survival depended on being fit and ready at all times. Nowadays there are many other reasons. To get fit. Adults join especially for this reason. The martial arts will get you fit in more ways than one. It will strengthen your limbs and build up your heart and lungs. Fitness is a very popular reason. To learn self-defence. Learning to defend yourself is another big reason to take up martial arts. There is no feeling like walking the streets with confidence, without any worries about your security and that of your family. For a child, protection from bullies is a very common motivation, and it certainly works. To make friends. Many good friendships are built in the dojo. They sometimes last a lifetime as strong bonds form when you train hard with others. All my friends are doing it. This is a very common reason for kids to start the martial arts, but probably less so for adults. Very often, if the leader of a peer group joins, the rest of the group will soon sign up. To be able to do what they do in the movies. Again, this is more likely to be the motivation of a much younger person. In my day, it was Bruce Lee. When I started Kenpo for the first time at 18, this was my main motivation. I thought it would be cool to be able to move like Bruce Lee. To obtain self-discipline and focus in my life. When I took up Kenpo again at 26, this was my main motivation. I was lacking direction in my life at the time, and the martial arts got me back on track. I have studied Kenpo since. My kids started it, and it looked like good fun, so I did too. Many of those in our adults/parents classes started for this reason. Others started to help their children out. Some of them are now black belts. My parents made me take martial arts. Unfortunately some kids start for this reason. Although I don’t support forcing it upon children, I have seen a number of children who, after obtaining black belt level, are happy their parents insisted upon it. To have fun. Many kids join for this reason, as having fun is the biggest goal of a child. For whatever reason people join martial arts classes, it rarely stays the same as they progress through the ranks. For me, competition, self-defence, and fitness became the most important reasons as time went on. Also, it became my life’s passion. Why do you study martial arts? I pose this question to all of you. Let’s make this a fun post and get lots of answers, ok? It was a mildly cool night in San Diego in the winter of 1992. I was with Laurie, my girlfriend at the time, enjoying a quiet dinner at an Italian restaurant in La Jolla. 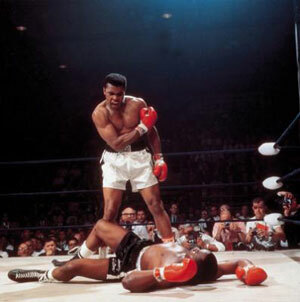 We heard a great commotion at the door, and in walks Muhammad Ali, the greatest heavyweight boxer of all time. A large entourage followed behind him. As he sat down, the whole of the restaurant focused on Ali, watching his every move. We found out later he was there celebrating his 50th birthday. I said to Laurie, “I really wish I could meet him”. She said, “Why don’t you?” I explained, “You don’t just walk up to Muhammad Ali and say hello”. She looked at me and said, “Why not?” I thought for a moment and said, “What would I say to him”? She said, “Just be yourself, and the conversation will take care of itself”. I thought, how often in life do you get a chance to meet one of your true heroes? Before I could talk myself out of it, I shot up out of my seat and walked over to him. I patiently waited for the moment he had a break in the conversation with his friends; I did not want to interrupt Muhammad Ali. My heart pumping wildly, I put my hand out and said, “I would like to introduce myself. As a martial artist, I have always admired what you have contributed to boxing and also to karate”. I told him I was aware of how Bruce Lee and many others had emulated his footwork and movement in the ring and how the martial arts had benefited from this. He looked at me and in a very soft, gentle voice said, “You know what? Not many people know that. I am pleased that you realised where it came from. Here, let me give you my autograph”. He wrote his autograph out for me, as we continued our chat. Needless to say, I was beside myself as I thanked him and walked back to my seat. As I sat down Laurie smiled at me and said, “See, that wasn’t so hard. All you have to do is reach out for the things you want in life”. I regret that I did not have my camera with me that night. But many years later, I look at this autograph from one of the true legends of sport in my lifetime, and I smile to myself. The Night I Met Muhammad Ali: Getting What You Want Out of Life is an original article by Sensei Matt Klein. 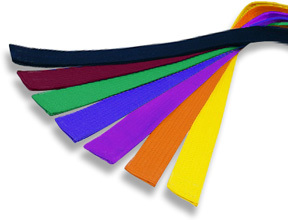 Karate Belts: What do the Colours Mean? The order of belts in Kenpo is different from many other systems. 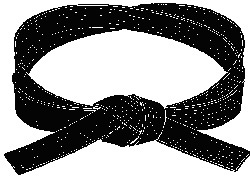 The idea of ranking karate belts according to colour was introduced by the Japanese at the turn of the 20th century. Each belt signifies a progression in skill, but more importantly a change in attitude. Today there are many different ranks in countless systems across the world. In Kenpo Freestyle the belts progress as follows with their meanings explained. Keep in mind there are many interpretations of this. White belt means absolute beginner, a clean slate, and is the colour of innocence. There is no shame in being a white belt and the instructor, most of all, realizes this because he or she was once one. Yellow belt and Orange belt-these colours represent a new beginning as these colours are seen at sunrise. They reflect enthusiasm, passion, and energy. Yellow is also associated with hope. Orange is a darker colour, reflecting greater maturity than Yellow. Purple belt represents springtime and creativity. It is the stage where a student is still fresh, but is becoming increasingly creative in applying techniques. Blue belts are reaching toward the blue sky and show maturity in the middle stages on the road to black belt. The colour blue means calmness, responsibility, strength, and reliability, and blue belts typically embody these qualities. Also, in a blue belt you can see the fluidity of movements, like water. Green belts are the last in the intermediate stages of training. Green signifies the branches and leaves growing upward and outward, reaching toward the sky. The change in colour from green to brown also portrays the change in colours to autumn as the student gains experience. Brown is the colour of the earth and is the first advanced belt. It represents the roots of the tree planted firmly in the earth. It is a steadfast and reliable colour. At this stage the student becomes more watchful and critical, and is striving for perfection. Black belt signifies power, both mentally and physically. It also represents mastery, calmness, and dignity. It is just the start of a path to true mastery of the art as the student climbs the ranks of black belts, 1st degree through 10th degree. White belt completes the circle. Look at the belt of a sensei who has been a black belt for 30 years or so and it is white. It is at this stage if not before that a true sensei realizes how little he or she knows in the whole scheme of things. Just as you cannot rush a plant through its growing stages, a martial artist must progress slowly and naturally through the belts to achieve proficiency and maturity.